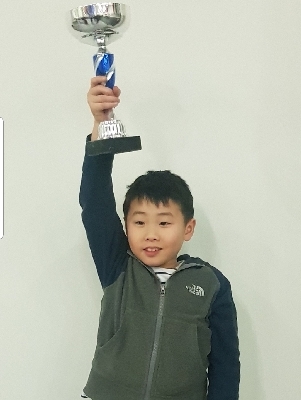 Congratulations to Noah on winning all six games to earn first prize in the Under 9 tournament at the KJCA Grand Prix of January 2019. The event was held at the Cornwallis Academy in Maidstone on 5th January and there were 35 players in the Under 9 tournament. Kent Grand Prix tournaments are run by the Kent Junior Chess Association (KJCA) who also select the Kent County Junior teams for national competitions. Conor has finished in joint first place at the 2018-19 Hastings Masters tournament. A fantastic result! 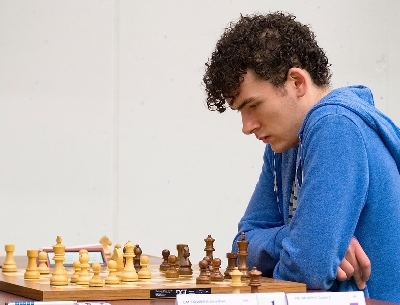 He scored 7 points out of 10, beat grandmaster Sulskis and drew with two other grandmasters. Furthermore he achieved a norm towards the International Master title. Sophia flew all the way from New York especially to visit the club on Monday 19th November. Well, maybe attending the World Championship match in London also had something to do with it. In the photo with Sophia are Mateusz Bazan and Shreyas Royal. 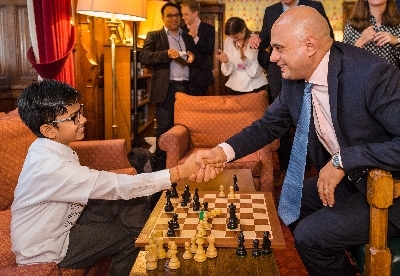 Shreyas Royal visited Parliament on 17th October and was challenged to a game of chess by Home Secretary Sajid Javid. There are no prizes for guessing the winner. Sophia and Jaime are sister and brother who were once junior members of Charlton chess club. Sophia can be spotted in the 1978 photograph on our "History" page. After over 30 years away they have got back in touch with us! Jaime emigrated to Australia and now works in banking in the Middle East. Sophia moved to the USA and works full-time as a chess teacher, organiser and arbiter in New York. Sophia hopes to be in London in November for the World Championship match and to pay us a visit at Mycenae House. We look forward to meeting up again! In case you missed the good news, the Home Secretary intervened personally to grant permission for Shreyas Royal's family to remain in the UK. 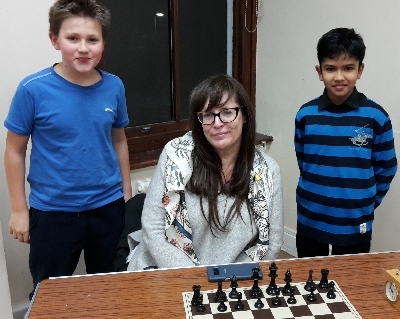 We started term-time junior training sessions at Mycenae House in April 2018 following the suggestion of a parent, as many primary schools do not have a chess club. The sessions are aimed at children relatively new to chess and have been well attended. Junior training starts at 6:30pm and lasts one hour, roughly 30 minutes instruction followed by 30 minutes playing chess. We charge £5 per child per session. The last session before summer holidays is Monday 9th July and will restart on Monday 10th September 2018. During the summer break children are welcome to come to our normal club nights on Mondays, which start at 7:00pm. These will be free of charge. In our first season back in the Intro Cup, Charlton reached the final after beating Medway in the semi-final. Kent finals day took place on 14th May in Dartford. The match against Maidstone went to the wire and in the end one move in one game decided the result. On this occasion we were the losers. Well done to our young team and good luck next year! CHARLTON CHESS CLUB IS MOVING! After 70 years we are leaving Charlton House. From 9th April 2018 the chess club meets on Mondays at Mycenae House, 90 Mycenae Road, SE3 7SE. Charlton House is closing earlier at 9:30pm which does not give us enough time to play league matches. 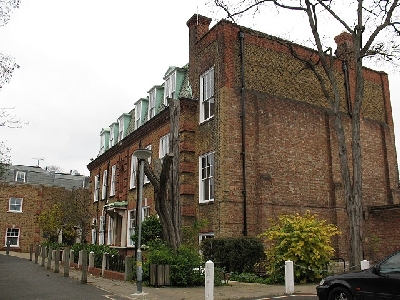 Mycenae House is one mile away, near Blackheath Royal Standard and Westcombe Park Station and is open until 10:30pm. It is easy to get to by public transport, we will have a large room and there is also a coffee bar. In its first season back in the Intro Cup, Charlton has qualified for the Semi-final. Our team will be paired against the top team from Non-Metropolitan Kent. Now through to the Final v Maidstone on 14th May! Well done Shreyas Royal who has just won (on 18th February) the West of England Under 14 Championship. Amazingly, he will still be eligible for this event in five years time! 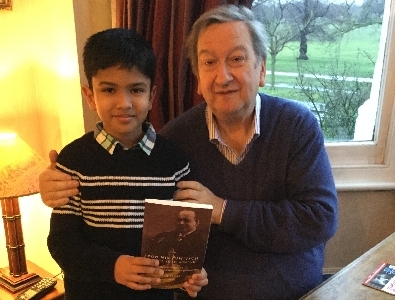 The photograph is of him meeting grandmaster Raymond Keene, chess correspondent of The Times. 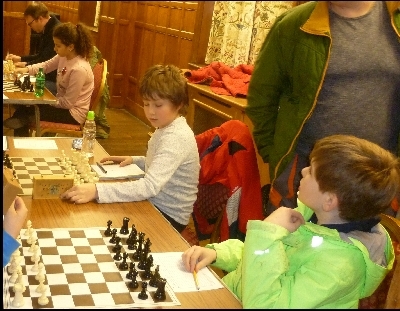 One-day tournaments with six rounds are popular these days, the Petts Wood Rapidplay was held on Saturday 3rd February 2018. 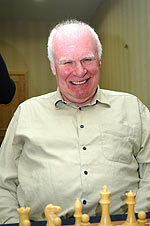 Congratulations to Robert Stebbings who triumphed in the Minor section and walked away with the £150 first prize. 2017 KENT SUMMER QUICKPLAY - Charlton won it! The final was played on 23rd January 2018 at Charlton House and we beat Rainham by the narrowest margin. In the last four games, two featured illegal moves and another ended with both flags down! When the dust settled Charlton emerged winners by 8.5 points to 7.5. 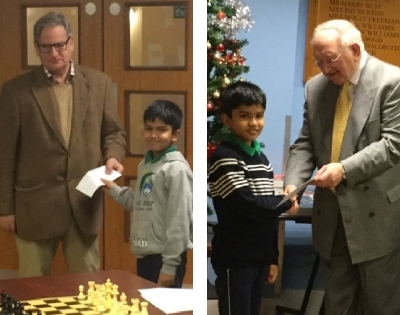 Charlton's globe-trotting eight year old Shreyas Royal won not just one but two prizes at this year's Hastings Congress! 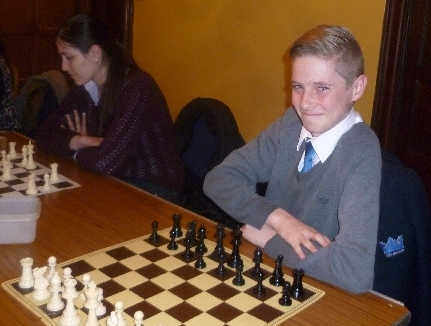 Conor Murphy also did well in the Masters tournament, beating GM Hebden in one game. Charlton's young team in the Kent Intro Cup has got off to a good start, winning three of its first four matches. Here they are in action at Charlton House on 19th December 2017. WHAT IS THE BEST OPENING MOVE? Even world champion Magnus Carlsen is not sure. Luckily Shreyas Royal was on hand with some advice! 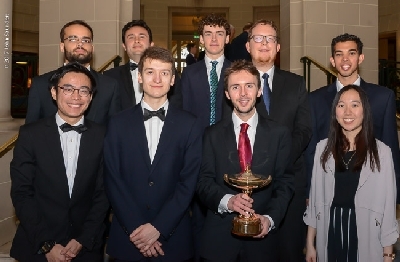 The occasion was the London Chess Classic at Olympia, December 2017. 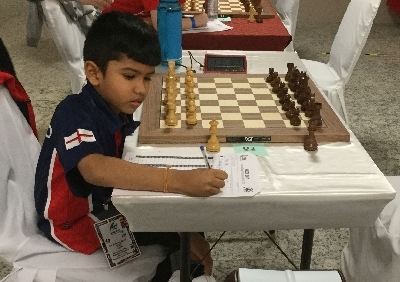 Shreyas Royal won his last five games in the World Under 8 Championship in Brazil in August finishing with 8 points out of 11, equal fourth and the top England player. 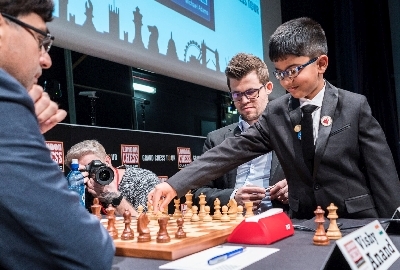 England sent a squad of six players for the different age categories, supported by two grandmaster coaches and accompanied by parents. 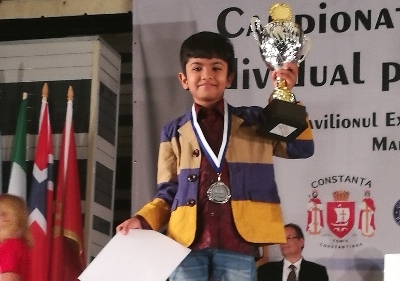 Following his success in Brazil, Shreyas travelled to Romania in September for the European Under 8 Championship. He won 8 games out of 9 finishing equal first and winning the Silver medal! Conor Murphy had a busy and successful August, scoring 5.5 out of 9 in the British Championship in Llandudno and good results in two other events. His FIDE rating has rocketed to 2313 which qualifies him for the FIDE Master (FM) title. 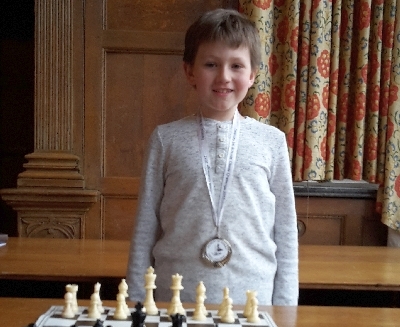 Congratulations to Mateusz Bazan on finishing second in the Under 9 age group of the UK Schools Chess Challenge, Essex Megafinal. The tournament was held in Basildon on 14th May 2017, Mateusz won five games out of six and qualified for the Southern Gigafinal in July. From May 2017 we aim to start club nights at 7 o'clock. Our room hire is from 7pm to 10pm so having several junior members it makes sense to start promptly. Also, Tony and Alan are offering some free tuition at the start of each session. Conor Murphy (back row, centre) represented Cambridge University in the annual Oxford v Cambridge match on 11th March 2017. Oxford won narrowly on this occasion, but we look forward to Conor telling us about it whilst back home for the Easter break. The 2016 Annual General Meeting was held on Tuesday 27th September. Officers remain the same apart from Jim Jackson becoming deputy chairman. We have entered two teams in the Kent League in 2015/16, in the En Passant and Tom Fuller cups. Sadly, Charlton will not retain the Lewis Cup following defeat by Rainham in the semi-final on 27th April 2016. Firstly, six players were reduced to five when one team member travelled to Rainham, Essex rather than Rainham, Kent. 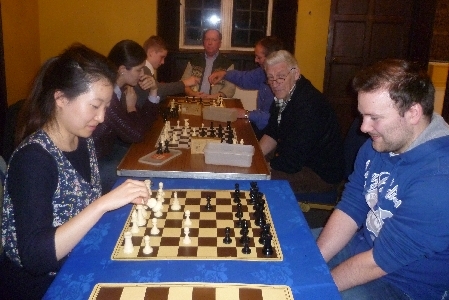 Then, the remaining five players all went to Rainham chess club's old venue before eventually locating the correct address. 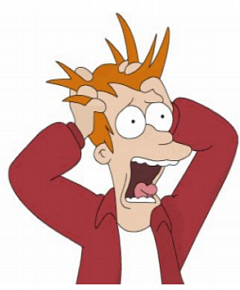 Apparently, nobody has ever seen team captain Alan Hanreck look so stressed! Our Annual General Meeting took place on Tuesday 29th September at 8pm. The club made a loss of £274 in 2014/15 but subscriptions are unchanged apart from a new rate of £35 for seniors (age 65+). Officers remain the same apart from Terry Lloyd becoming deputy chairman, David Thomas taking over as internal tournament controller and Robert Stebbings elected to the committee. We have entered three teams in the Kent League in 2015/16. Jim Everson with the trophy. Charlton's first team won the Lewis Cup, beating Tunbridge Wells in the final on 10th May 2015. The match was played at Kent Finals Day at the Mick Jagger Centre, Dartford. The Lewis Cup is our first trophy since 2012. Despite only being able to field five eligible players and having to default board 6, Charlton won by 3.5 to 2.5 points. The winning team was Phil Morris, Alan Hanreck, Conor Murphy, Jim Everson and Terry Lloyd. The seven trophies competed for at Kent Finals Day are the County Cup, Lewis Cup, Stevenson Cup, En Passant Cup, Harvey Cup, Tom Fuller Cup, Intro Cup. Attendance at club nights has much improved and the Bugle Horn in Charlton Village may have noticed more custom late on Tuesdays. We are pleased to welcome two new members, Roory Lee (from Seoul) and Harry Foy (from closer to home). 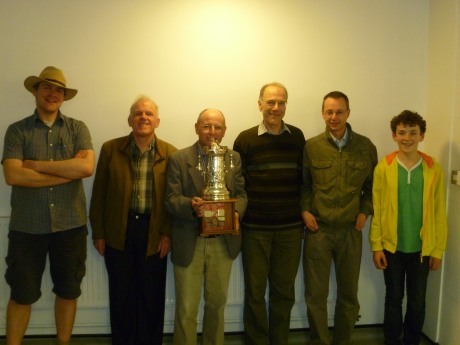 By beating Sussex on Saturday 7th March 2015, the Kent open team won the 2014/15 Southern Counties championship. Victories were previously achieved against Middlesex, Essex and Surrey. The next match will be the National Counties Championship semi-final in June. Four of the sixteen players in the team were from Charlton: Tony Stebbings, Phil Morris, Alan Hanreck and David Morris. 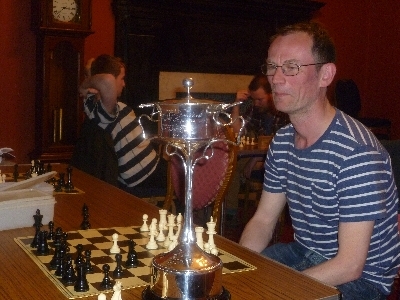 Congratulations to Tony Stebbings on achieving the FIDE Master (FM) title. His FIDE rating broke the 2300 barrier following the European Clubs Cup held in Rhodes in October. 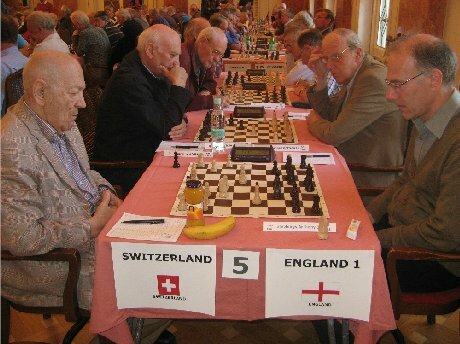 The photo shows Tony (right) playing against former world championship contender Victor Korchnoi in 2012. Charlton's first team retained the Kent County Cup by beating Beckenham & Bromley in a repeat of last year's match at Finals Day on 13th May. We have now won the cup for four of the last five years. 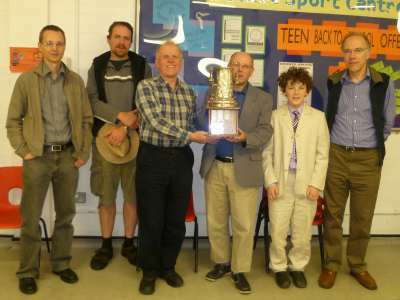 The winning team was (left to right) Reenen duToit, Philip Gregory, Alan Hanreck, Tony Stebbings, Philip Morris, Conor Murphy. Charlton looked to be winning the match comfortably but a couple of wins slipped away in the quick-play finish and the final score was 3 points all, Charlton winning on board count. Peter was our longest standing member, former club chairman, and the driving force behind many of the club's most successful years. He died peacefully at home on 10th April. 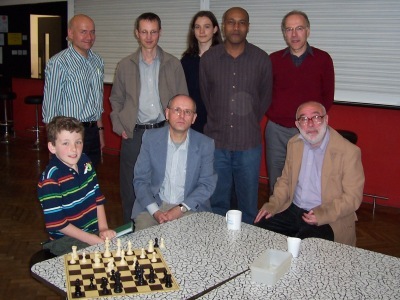 He was a major figure, not only at Charlton, but also in Kent and English chess circles. An ECF arbiter, organiser of the Charlton Congress and host at his house in Sidcup to many itinerant international chessplayers over the years. 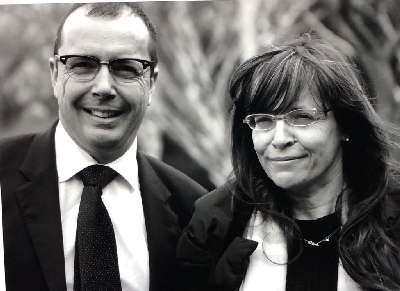 The funeral was at Eltham crematorium on Tuesday 24th April and many of Peter's old chess friends were there. Sincere condolances to Rose-Marie and his sons and family. Charlton's first team regained the County Cup by beating Beckenham & Bromley in the 2011 final at Kent Finals Day on 15th May. A great end to the season! The winning team was (left to right) Philip Morris, Reenen duToit, Philip Gregory, Alan Hanreck, Conor Murphy, Tony Stebbings. The final score was 4.5 to 1.5 after a tough match. 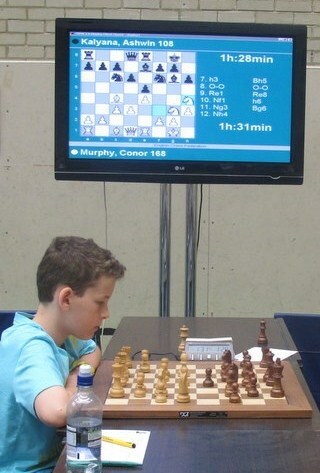 Conor Murphy in play at the 2010 British Championships during August. Nigel Norman was Charlton's other representative in the championships, held at the University of Kent at Canterbury. 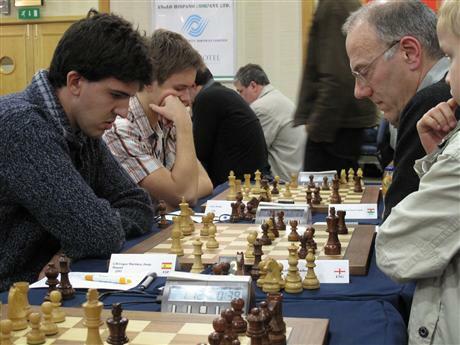 Tony Stebbings (right) playing against Spanish Grandmaster Lopez Martinez in the Gibraltar Masters tournament earlier this year. The game ended in a draw. The club's longest standing member Peter Hannan was also in Gibraltar and picked up a very handy £400 by coming second in the Amateur tournament. Two Charlton teams reached the Kent finals held at the Mick Jagger Centre, Dartford on 10th May 2009 where seven cups were being competed for. Our first team retained the Kent County Cup, beating Lewisham by 4 to 2, so is officially the best team in Kent! Our third team narrowly lost to Snodland in the Tom Fuller Cup final by 2.5 to 1.5. The photo is of some of the Charlton players. 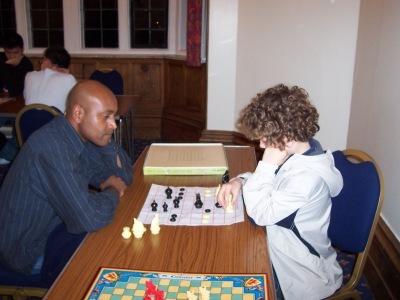 Rawle Allicock (left) is the 2008 British Draughts Champion and represented Britain at Beijing in October. Here he tries his hand at Makruk (Thai chess) on our Games Night. Games Night September 2008, playing Xiangqi (Chinese chess). Games Night is an occasional event where we try out "Kriegspiel", an intriguing variant of standard chess, and Go, Draughts, Shogi, Chinese chess and other exotic games. If you prefer, just stick to normal chess!